It's been a little while since I have entered a challenge but this one - I just could not resist! I call this "Old Timer playing the Old Timer". This is my friend Joyce who also happens to be our neighbour. She turns EIGHTY years old this Thursday. She is not like any 80 year old you have ever met. She is vibrant. She is funny. She is modern(ish) and she loves us. We have this ex-Pianola on our back Patio. It is ex because all of the pianola mechanisms have been removed leaving it to operate just as a piano. It has a real honky tonk tone. Joyce is a gifted musician. She can't read a note, plays by ear. She plays the piano, the piano accordion and the mouth organ. She volunteers her time 4 days a week to play for all of the old people in the retirement and nursing homes. Many of those old people are younger than her. She loves that. The hands you see here playing the piano have been in our lives for just over 20 years...they are hands who have raised 5 kids of her own on. her. own. For many amazing hand photos - head on over to i heart faces and check them out! LOVE this one! it makes me happy! great job! The feel of this photo is captivating. Nicely done, I love the feel of this photo. 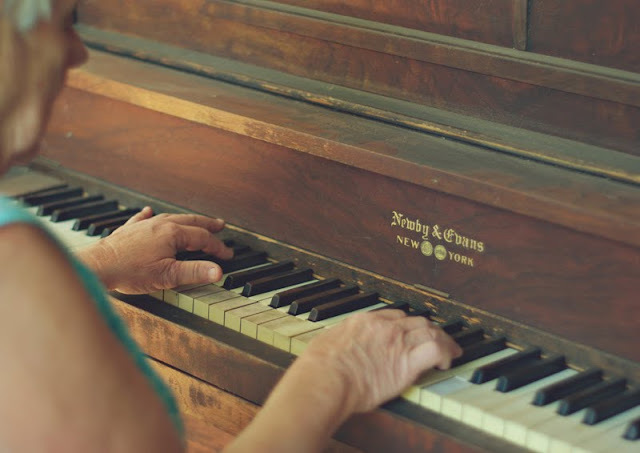 I love how warn the piano is and the feeling of nostalgia in this shot! I just absolutely love this picture! Your processing is perfect and your words are wonderful to go along with them -- glad you entered! I agree, this gives a very warm and cozy feeling. Your beautiful photo does justice to a beautiful woman. Just lovely. Beautiful! Nice to see she is still going strong at 80! You can hear the music through the photo! Wonderful shot!! This is such a lovely picture. I love the vintage tones. Thank you for leaving comment full of love and support on my blog.